Well, I read a lot, and only two of the books I'd acquired from the list really moved and horrified me. This was one of them. (The other was The Sadist’s Bible, by Nicole Cushing.) 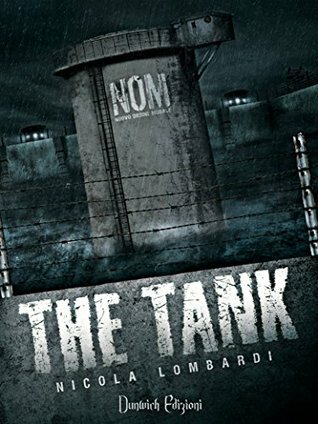 I finished The Tank last night and the ending was every bit as bleak as I'd expected. I'm not going to tell you what it's about, or what the titular Tank is for. No, it isn't the kind of tank with a gun and metal treads. But this story follows a single character through a year of their life, and almost every moment of it takes place within just a few rooms. In lesser hands that could be repetitive and slow, but I never felt that was the case here. I was always compelled to read on, even when I occasionally felt sick. I _had to know_. And the character arc and revelation both rewarded me and punished me for my morbid curiosity, totally in keeping with the contents of the story. Some things are so horrible that they create a sick fascination; the imagination wondering "What would it be like if ..." and refusing to stop prodding and probing. Here the reader almost experiences the same gruesome obsessions as the protagonist. Why are we doing this? What awaits us? Will our soul be permanently degraded by the experience? And what is the worst punishment for a crime? The story is set within a totalitarian fascist regime, the New Moral Order (NMO). We have the stifling observation and secrecy of 1984 crossed with the moral bleakness of The Road, and told through a perspective that isn't a million miles away from "potentially deteriorating mental stability of a lonely lighthouse keeper" stories. I thought this book was brilliant. It did everything it should, but with the most important being: make me pick up the book again and carry on. To know the truth even though I suspect what it will be, and it won't be pleasant. There is one element I haven't touched on. The translation. Much as I hate to criticise things, it sometimes reads as if Google did it. On the one hand we get strange turns of phrase that wouldn't come about from a native English speaker - and that's actually not a problem. If anything it adds to the charm and the alien-ness of the thoughts, and the freshness of the imagery, and I would keep that aspect. However, there are also a lot of typos and incorrect words, and they are all ones that would have been easily picked up by a native-English proofreader (e.g. "the voices were suddenly louder know.") Now, please bear in mind that I am a stickler for punctuation and writing and grammar. I make my living as a writer and editor. I have been known to drop books for far fewer mistakes. So, the fact that I give this five stars DESPITE THOSE ERRORS is a huge vote of confidence. I am sure the original work in its native language is much more eloquent, and the issues are all minor translation issues that could be easily fixed whilst keeping the bulk of the translation exactly as it is. It's as if I am looking at the original story through a dirty window. And the view is enough that, despite the grime, or the barriers to communication, I keep looking. That's actually high praise. This is truly one of the most compelling and horrible books I've ever read.